A person once told me that a fruit contained seeds within and a vegetable is self propagating. Tomato and squash are fruit. Strawberry and banana are vegetable. Seeing has they start off as a single cell organism. I have no idea what thought process involves considering mushrooms "meat." That is sort of bizarre, don't you think? Botanically speaking, yes, they are both fruits. But in 1893 the Supreme Court ruled that for the purpose of determining import tariffs, the culinary term "vegetable" applied to the tomato, rather than the botanical term, because of the way they are commonly used. It came to this because imported vegetables were charged tariff, while fruits were not. The culinary terms fruit and vegetable are based on primary usage, not botanical distinctions, and on a rough division between savory and sweets, but are somewhat arbitrary. Bananas and strawberries both have seeds. Modern Cavendish bananas have been selected to have very small, soft, hardly noticeable seeds, but you can still seem them if you look closely. 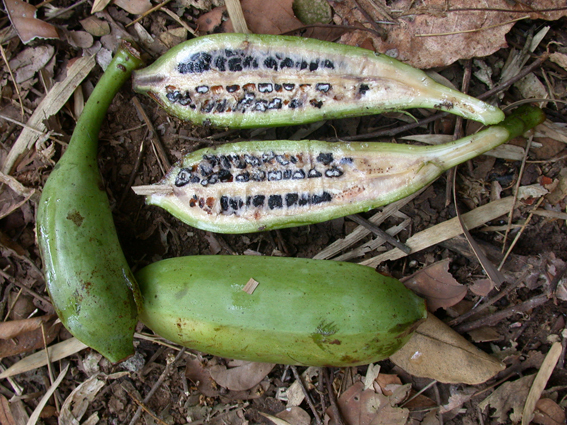 Wild bananas can grow from seeds or they can send out new shoots from the base of the plant. Other plants like figs, paw paws, raspberries, currants, etc. do the same thing. And of course strawberries have very visible seeds all over the outside. They're usually propagated from runners because it's much easier/faster and you get a genetically identical plant, but they can also be propagated by seed. (1) (botany) The seed-bearing structure in angiosperms formed from the ovary after flowering. Vegetable doesn't really have any real botanical definition, it's a culinary term and is rather ambiguous. A lot of botanical fruits are consider vegetables, grains, spices, etc. for culinary purposes (cucumbers, okra, corn, wheat, peppers, eggplant, etc.). Last edited by EugeneOnegin; 10-02-2013 at 08:30 PM..